What to do in Dingle? Too many things to count. This post only lists 10 things, but one could easily find 50 to 100 things to do in Dingle – a peninsula off the south-west coast of Ireland. It’s a bit out of the way and often missed by the whirlwind bus tours that circle the whole country in 10-14 days. But Dingle is such a worthy destination in and of itself. It alone is reason enough to travel to Ireland. One could spend a week, a month or a summer there and never tire or it. Dingle has a mystical landscape. It is a thin place where the veil between this world and the eternal world is thin. Plus it has a great downtown, shopping, good food, beautiful beaches, culture, heritage and some of the most outstanding traditional Irish music in the country. No matter how much time I spend in Dingle, I always want to stay longer. What Should I Do in Dingle? People ask me all the time, “What should I do in Dingle?” So here are my top 10 pics in no particular order. The map below shows the location of each recommendation. Make Dingle a stop on your Ireland tour. Allow 3 days and do all 10 things. You’ll never forget the experience. There are several archeological / nature walking tours in Dingle. I’m sure all are good. But when given choices I try the smallest or most local business first. Celtic Nature Walking Tours is my choice when I take tours to Dingle. Kevin O’Shea offers a wide range of walking tours that put the guest into the wild landscapes of Dingle with great commentary that includes, history, archaeology, and mythology supported by Kevin’s wit and gentle nature. I’m not a big fan of bakeries but OMG! The Irish buns and bread baked here are to die for. Just across from the Harry Clarke windows in a little shopping courtyard. Talk about comfort food in a relaxed setting! Courtney’s Bakery is a real treat. 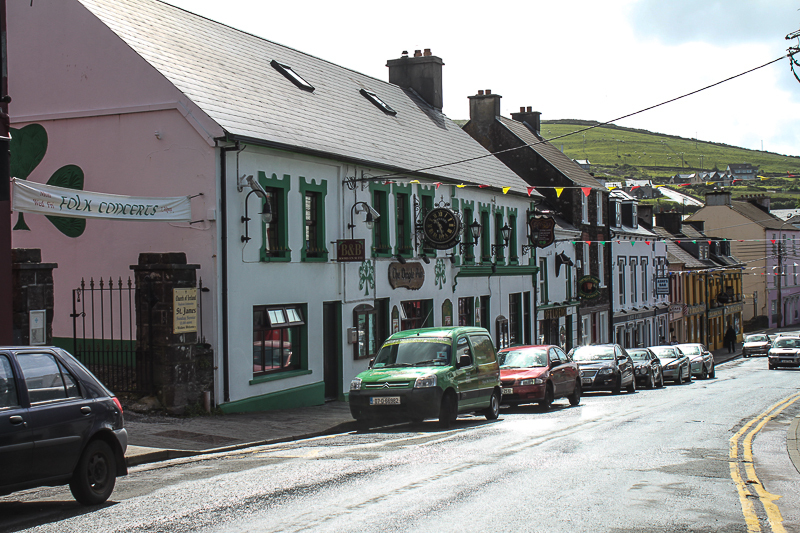 Shop at the An Gailearai Beg – West Kerry Craft Guild shop on Main Street (18 Main Street) near the Dingle Pub. Shop is operated by the Guild and has many crafts at affordable prices, all made by local artists. This is a great shop for special, meaningful gifts to bring home. Also, take a look at Caifé Liteartha, the bookstore of Seoirse Luasa, Ireland’s foremost bibliophile. He’s been in business for over 45 years and can locate copies of old books or help you match books with interests. Located on Dyke Gate Lane. My favorite music event in Dingle is the Folk Concert at St. James Church on Main Street. The old Church of Ireland church building has been repurposed as a performing arts venue and meeting place. The concerts are held three nights a week from April to October. Tickets can be purchased at the door or at the Dingle Music Shop downtown (next to the Dingle Bay Hotel). I love this event because it’s earlier than the Trad sessions in the pubs and it strictly for listening. They feature some amazing local musicians. Dingle is well-known for its trad music sessions in the local pubs. Ask your friend, hotel operator, B&B host or anyone you know and trust who knows Dingle to recommend their favorite spot for music. There are many. My favorites are the Dingle Pub on Main Street just across from Benners Hotel and O’Sullivan’s Courthouse Pub. Most days I’m in bed by 9:00 pm but that’s when Dingle folks are just starting the exciting part of their day. Staying up is worth it, because these sessions are some of the richest in Ireland. It’s Irish traditional music at its finest. Dingle has many artists. But Carol Cronin will tell you the story (if you ask) about how living on the Great Blasket Island transformed her as an artist. And it shows in her work, which you can view at the Carol Cronin Gallery on Green Street. I was mesmerized by her ability to capture in her paintings, the emotions I felt when I visited Dingle. When I asked her about if living in a “thin place” like Dingle affected her art, she allowed me to record her answers in a short video interview. I don’t even care for fishing much. I tend to get bored. But I’m married to a fisherman and see the importance of a destination like Dingle for fishing. Dingle is a working harbor where people earn a living from harvesting the sea. Watching these fishermen operate these massive boats and handle the fish can be a cultural experience. The ships are big and colorful, making for interesting photographs. There are several places to find out about head boats that go out for the day. Being able to get on a boat and see Dingle and the Blaskets from the water is a whole new Dingle experience. Most everyone knows about the Slea Head ring and Connor Pass – scenic drives mentioned in all the guidebooks. But there’s a shorter, easier drive, used mostly by locals, that offers panoramic views of the western end of the peninsula. The drive to Mam Closach starts at a turn off the Slea Head loop drive near Dunquin. I’ve marked it on the map Google map at the top of this post. This road cuts back across the hills toward Vestry and into Dingle town. It sort of slices the Slea head loop in the middle. There are some fabulous views from this road. (2 places marked on linked Google map) At the mark closest to Dunquin are spectacular views of the Blaskets. At the summit of the hill, the panoramic views of the west end of the peninsula are vast. This road less traveled is a superb place for personal reflection and pictures. 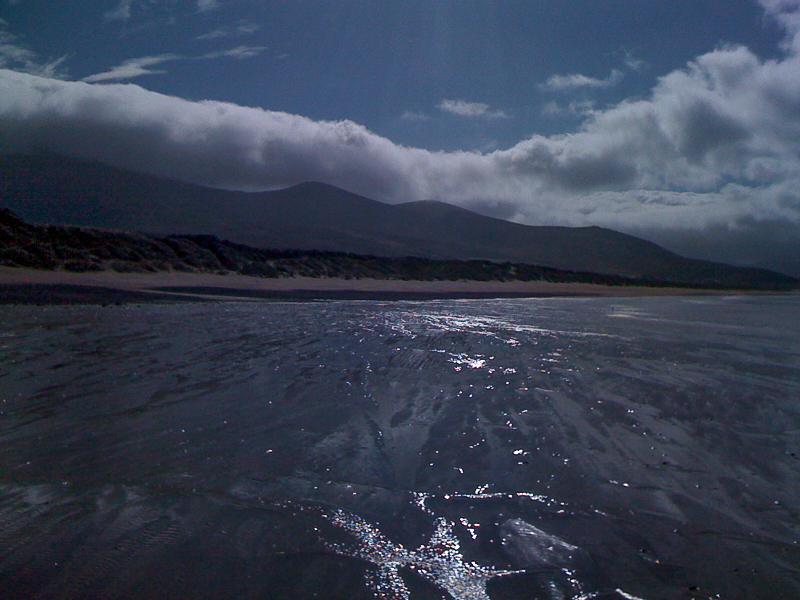 BEACHES / STRANDS – The most intense way to experience Dingle is by walking. It’s then that you notice the details in the landscape – the lines, the curves, the effects of wind, the smell of the sod, the sounds of the birds and the waves crashing. The beaches (aka “strands”) are stunning with vast shores that stretch way out into the water especially on the windswept north side where Mount Brandon rises out of Brandon Bay. Magical things happen on these strands. My favorite strand is Fermoyle (identified on map at top of post). Another great walk is the Pilgrim’s Path from Ventry to Ballybrack, named for all the pilgrims who forged the path when they came en masse to make a pilgrimage to Mount Brandon. MOUNT BRANDON – The BEST walk is the walk up Mount Brandon from the end of the Pilgrims Path. It’s the easiest walk up the mountain that any healthy walker can accomplish. Mount Brandon, 9th highest mountain in Ireland at 3000 ft is considered a holy mountain. In pagan times people walked the Pilgrims Path up to the summit to give thanks the Lugh, the sun god, for blessing the harvest. In Christian times, St. Brendan prayed at the summit looking out toward the sea. He was inspired by a vision he received there to set out on a voyage to find a “Land of Promise.” One can feel the energy of the pilgrims and the spirit of Brendan on that summit. And the walk is doable. On the north side of the peninsula above Castlegregory, Route 560 stretches out to Rough Point. On the way is the little village of Kilshannig (marked on the map). 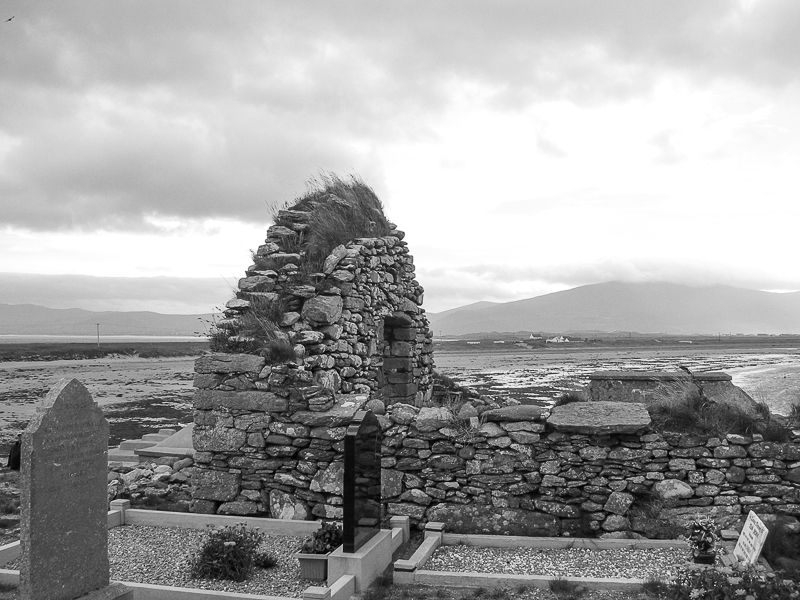 The name Kilshannig derives from the “Church of St. Senan.” Church ruins and a cemetery (noted on the map above) sit right at the water’s edge. The shore below is often awash with stuff that comes in off the ocean floor – sea glass, stones, china fragments. Some of the old graves have been washed out and there may be bones about from those graves. At first, it’s startling, but then the notion that our bodies really do all return to the earth in one way or another sets in. There is an old cross-pillar slab in the church ruin that dates to the 7th century. Kilshannig is a thin place with panoramic views of the Ocean, Brandon Bay and the mountains, particularly Mount Brandon. This little slice of Dingle is where I go in my mind when I want to feel like I’m in Ireland. Other sites – all very popular and worth seeing are – the Gallarus Oratory, the drive around Slea Head, Kilmalkedar Church with its ogham stone, the famine cottages, the coastal forts and the beehive huts. All worth seeing and are in the guidebooks, as well as known by the locals. The Blasket Centre on the mainland in Dún Chaoin on the tip of the Dingle Peninsula is a heritage centre and museum with gorgeous interpretive displays that honor the community that lived on the Blasket Islands before the final evacuation in 1953. The Centre tells the story of island life and the community’s struggle for existence. It also has grand displays on the language and literary legacy, including Peig – the biography of an island woman that was dictated in Irish and then translated. The Centre also features displays on the island culture and industry, which was fishing and farming, traditional life including modes of work, and transport, home life, housing, and entertainment. It is the next best thing to actually visiting one of the Blasket Islands. I am looking for the best bed and breakfast trip for approx. 6-10 days. Any suggestions?? Mindy, I don’t know if it’s appropriate that I post this here, but I love Bambury’s Guest House in Dingle. Great rooms, great breakfasts, and you can walk to town from here so no worries about having to find somewhere to park or driving after having drinks in a pub. The Lighthouse B & B in Dingle is a great place, Bambury’s Guest house is as well as any of the B & B’s in town. Most book up quick this time of year. Or a better option for your budget if you are planning to stay in Dingle for the entire time and venture out on a short day trips to places like Ballybunion, Cork, Killarney or the Skillegs Islands …Your best bet would be to rent a house in town then you can make most of your meals at home, and have a little privacy. See ImagineIreland.com. Good Luck Dingle is a lovely town, I visit often if you have any more questions. Mount Brandon is the ninth highest mountain is Ireland. Magic.